A leading East Yorkshire forecourt operator has been named best in the country at a glittering national awards ceremony. Sewell on the go fought off stiff competition from other industry leaders to secure Forecourt Trader of the Year at London’s Park Lane Hilton hotel on September 15. The accolade at the Forecourt Trader of the Year awards recognised the business as best in its field and highlighted its recently refurbished £1.5 million South Cave service station as second to none. It was the highlight of an already successful night, which saw Sewell on the go pick up five other awards, including Best Customer Service and Best Community Engagement in the UK. Sewell Group Managing Director Paul Sewell said: “Great businesses are made by great people and the achievements at the Forecourt Trader of the Year Awards are theirs. “We can provide first class facilities, but it’s the people serving our customers who make us number one. Sewell on the go was shortlisted in 14 categories overall, with Hull West and Maybury service stations also winning awards. Patrick Sewell, Managing Director of Sewell on the go, said: “These awards are recognition of how hard our people work. “Day in, day out, 24/7, 365 days per year, they serve our communities and go the extra mile. “Everyone from smaller independent retailers to the bigger forecourt retailers was at the awards and it was fantastic to see Sewell on the go recognised on the national stage. Sewell on the go South Cave also recently became the first forecourt in the country to be awarded a full 5* rating in an independent spot check by Forecourt Trader’s ‘Shop Doctor’, becoming the first site to hit full marks in all 10 categories in the last 10 years. 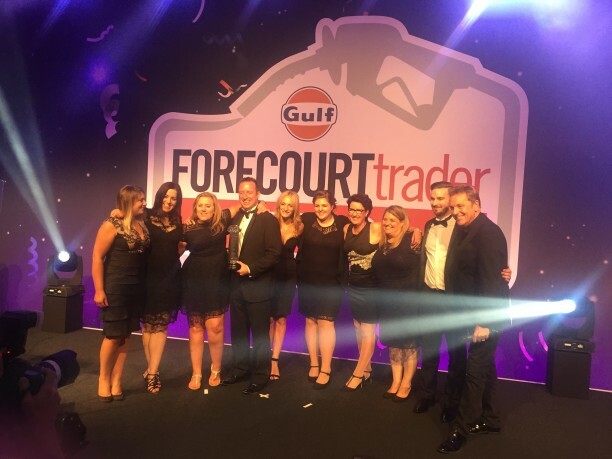 It is the second time Sewell on the go has been awarded the overall Forecourt Trader of the Year award after its Chanterlands site in west Hull reached the top spot in 2009. Merril Boulton, Editor of Forecourt Trader, which is the leading authority in the industry, said she and her colleagues were highly impressed with Sewell on the go South Cave. She said: “It isn’t just that it’s a lovely forecourt and a good development, when you walk in the shop there are lots of nice touches and it’s well thought out with good innovations. “It’s a nice, complete package for customers. I have seen it and we all said ‘wow’. All 12 Sewell on the go fuel and convenience stores offer free WIFI, free ATMs, Costa coffee, BP fuel and everyday essentials. Serving more than four million customers every year, Sewell on the go makes sure communities and customers have everything they need to keep going, at home or on the move, day or night.